This stunning, 3 bedroom/2 bath, "beach chic" style top floor unit is just across the street from spectacular Kamaole III Beach. Ideally located in the Kamaole Sands resort in sunny South Kihei, adjacent to the upscale Wailea Resort, this affordable beach retreat is a great value for budget-conscious larger families or groups of friends traveling together. Located in the preferred Building 10, on the lush central courtyard. Close to the beach, but without the road noise (it's 14 units away from the end closest to the road/beach). Kamaole Sands boasts 15 acres of tropical gardens with fish ponds, fountains, and waterfalls. The complex also has one of the largest pools in Kihei with ample deck space for sun bathing. This unique unit is the largest unit in the complex at 1650 square feet, and the only one of this size (the living room is almost twice the size of the normal 2 and 3 bedroom units). Completely remodeled, there are 18" tiled floors throughout the unit. The living area is completely open and spacious with tall vaulted ceilings. The modern remodeled kitchen has stainless steel appliances and granite countertops and is fully-equipped for large families. The spacious living area is tastefully furnished with beachy island-style furnishings and also includes a twin daybed with a twin trundle under it, allowing comfortable sleeping for 2 additional guests on real beds (instead of a pullout sofa sleeper). 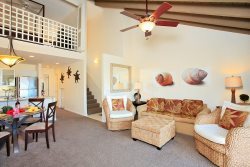 The living area and each bedroom all have flatscreen HDTVs and DVD players (family DVDs are provided). There is also a Nintendo Wii for the kids (Wii Play and Wii Sports games are already in the unit- bring your favorite games from home). The outdoor lanai (patio) offers great views of the landscaped courtyard area with fountain with nighttime fiber-optic lights and views of the ocean, as well. Complimentary high-speed internet access and FREE local and long-distance calls to the US/Canada. The bedrooms are all very separated, offering privacy for families or friends traveling together. Two of the bedrooms are on the main level, one bedroom has a queen bed and the other has a twin bed and a double bed. The upstairs loft-style master/guest suite is decorated with hotel-quality teak furnishings and a king-size, four-poster bed. All bedrooms have high-thread count luxury linens. Both bathrooms are completely remodeled with granite counters. Beach access to a sandy swimming beach (Kamaole 3 Beach) is just across the street from Kamaole Sands (there are no condos on the other side of the road, just the beach park), and many shops and restaurants are within walking distance. We provide large beach towels, lightweight beach chairs, boogie boards, tennis rackets, kids' sand toys, and cooler. For families with young children, there is a full-size crib, Pack-n-Play, high chair, booster chair, baby bathtub, reclining stroller, bed rail, and baby gate system that can be placed around the staircase up to the master suite or can be used as a large secured play area. There is one large A/C in the living room, this air conditioner does NOT cool the whole unit, just the living room. ALL 4th floor units at the complex are warm during the summer months, especially the upstairs master suite loft areas. Optional portable A/Cs are available for each downstairs bedroom for $10/day/AC unit. During summer months we recommend that heat-sensitive guests plan on sleeping in one of the downstairs bedrooms with a portable AC as the upstairs bedroom is not suitable for heat-sensitive guests. Please note that the portable A/Cs only bring down the temperature a few degrees so it's comfortable to sleep, they do NOT make the room "cold" like a central or wall system AC system does. *Both portable A/Cs for each of the downstairs bedrooms ARE INCLUDED in the $349/nt rental rate from June 1- August 31st (ACs are not included with discounted rates of less than $349/nt but can be rented for $10/day/AC). -Air Conditioning: There is one A/C in the living room, this air conditioner does NOT cool the whole unit, just the living room. ALL 4th floor units at the complex are warm during the summer months (approximately May 15- September 15), especially the upstairs master suite loft areas. Optional portable A/Cs are available for each downstairs bedroom for $10/day/AC unit. We recommend that heat-sensitive guests plan on sleeping in one of the downstairs bedrooms with a portable AC. Please note that the portable ACs only bring down the temperature a few degrees so it's comfortable to sleep, they do NOT make the room "cold" like a central or wall system AC system does. Both portable A/Cs for each of the downstairs bedrooms are included in the rental rate from June 1- September 1. There is one large A/C in the living room, this air conditioner does NOT cool the whole unit, just the living room. ALL 4th floor units at the complex are warm during the summer months, especially the upstairs master suite loft areas. Optional portable A/Cs are available for each downstairs bedroom for $10/day/AC unit. We recommend that heat-sensitive guests plan on sleeping in one of the downstairs bedrooms with a portable AC as the upstairs bedroom is not suitable for heat-sensitive guests. Please note that the portable A/Cs only bring down the temperature a few degrees so it's comfortable to sleep, they do NOT make the room "cold" like a central or wall system AC system does. *Both portable A/Cs for each of the downstairs bedrooms ARE INCLUDED in the $349/nt rental rate from June 1- August 31st (A/Cs are not included in discounted rates but can be rented for $10/day/AC unit).